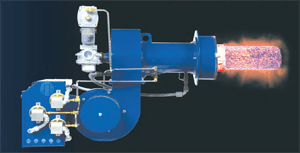 Power Flame's NOVA NP2 Ultra Low NOx gas burner achieves Sub 9 to 20 PPM NOx emission levels on a wide range of commercial, industrial and process applications. The burner relies on a patented, fully premixed surface stabilized combustion technology to minimize NOx emissions and assure complete combustion with minimal CO emissions. The NP2 achieves these performance levels without the use flue gas re-circulation. The NP2 is offered for firing rates between 700 and 6,100 MBTU/HR. The NP2 incorporates on ratio gas control valve and variable frequency drive combustion air fan as standard and is designed to meet today's most stringent emission requirements. Power Flame provides a U.L. Listed, factory tested package tailored to your job specific requirements. The NP2 is suitable for use on all types of boiler and other heat exchanger applications. It will operate with uniform heat flux and excellent flame stability over a broad range of operating conditions.